Attorneys from Weinberger Law Group, the state’s largest divorce and family law firm, have been named to this year’s list of New Jersey Super Lawyers and Super Lawyer Rising Stars. Being named to the Super Lawyers and Super Lawyer Rising Star lists is so meaningful because of the peer component of this recognition. Having our dedication to providing excellent legal care to our divorce clients acknowledged is extremely validating. Weinberger Law Group is pleased to announce that a number of the firm’s family law attorneys have been named to the prestigious Super Lawyer and Super Lawyer Rising Star lists for 2016. Each year, no more than five percent of attorneys practicing in New Jersey receive this designation. Attorneys recognized as Super Lawyers include certified matrimonial law attorney Bari Weinberger, founder of Weinberger Law Group, and attorney Erich “Rick” Schneider, also certified by the New Jersey Supreme Court to practice matrimonial law. Rising Star attorney honorees in 2016 include family law attorneys Veronica Norgaard, Rachel Partyka, Jason Tuchman, and certified matrimonial law attorney Jessica Sprague. Only a very small percentage (2%) of attorneys statewide meet the requirements needed to achieve certified matrimonial attorney status. Super Lawyers, a Thomson Reuters business, is a rating service of outstanding New Jersey lawyers who have attained a high degree of peer recognition and professional achievement. Attorneys are selected to the Super Lawyers list through a multiphase process that includes a New Jersey-wide survey of lawyers, peer reviews by practice area, and independent candidate evaluation, including number of years in practice. Nominees 40 years old and younger or who have been in practice for 10 years or less are eligible for the Super Lawyers Risings Stars list. According to Thomson Reuters, the review and candidate evaluation program results in a credible, comprehensive and diverse listing of exceptional New Jersey attorneys. “A major part of why being named to the Super Lawyers and Super Lawyer Rising Star lists is so meaningful to us is because of the peer component of this recognition. Having our dedication to providing excellent legal care to our divorce and family law clients acknowledged by others in the legal community is extremely validating and affirming,” said Bari Weinberger. 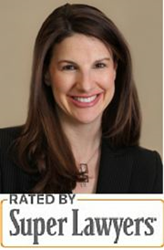 In addition to being awarded Super Lawyer again this year, Ms Weinberger has also received a Martindale-Hubbell Peer Review Rating based on the exemplary work in the field of family and matrimonial law. She was given an "AV Preeminent" rating from her peers, which means that she is deemed to have very high professional ethics and legal ability in the field of New Jersey family law and divorce. Inclusion in this year’s Super Lawyers list is one of several awards and accomplishments the Weinberger Law Group team has earned in 2016. Earlier in the year, the firm was named a 2016 Best Place to Work in New Jersey, the third consecutive year Weinberger Law Group has been honored for its positive workplace culture. To meet growing demand, the firm also expanded their Bergen County offices recently, moving to a larger and more modern space directly across from the Bergen County courthouse in Hackensack. Additionally, the entire staff came together to participate in community outreach efforts, including partnering with the NO MORE campaign to raise awareness of domestic violence by releasing free resources for those affected by spousal abuse. Plans for the remainder of 2016 include participation in Military Appreciation Month in May with family outreach programs for military families. Weinberger Law Group serves divorce and family law clients throughout New Jersey with offices in Bergen, Burlington, Morris, Monmouth, and Somerset Counties. The firm offers free initial attorney consultations for legal assistance with family law issues, including divorce, child custody, post-divorce modifications, domestic violence, prenuptial agreements, adoption, LGBT-related family law issues, and all other family law matters. To find out more about the attorneys selected as Super Lawyers or more about Weinberger Law Group, visit WeinbergerLawGroup.com or call (888) 888-0919.